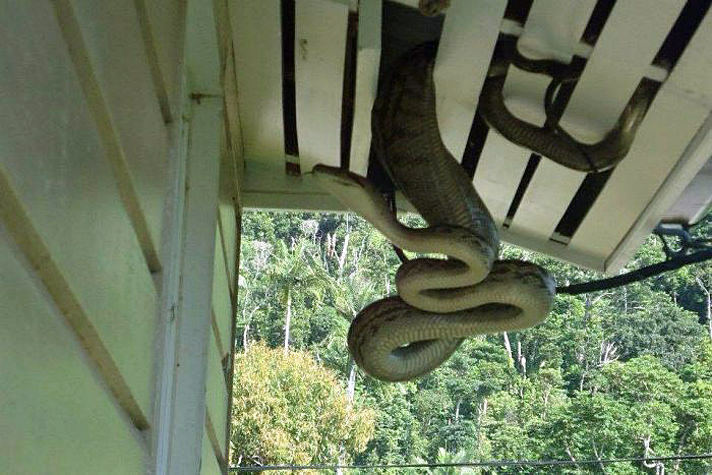 Home » Viral Posts » A huge python entered this house. A huge python entered this house. Something no homeowner ever wants to happen while they’re sleeping is for someone to come over uninvited, even less so if their intentions are less than noble. But what if that intruder turns out to be a massive 16-foot-long python dubbed a “kangaroo killer”? Trina Hibberd is an Australian woman living in Queensland’s Mission Beach who had one of her friends visiting when they were abruptly awoken by some strange noises in the house. When they went to investigate they discovered the snake (like it would be hard to miss) and promptly called animal control to handle it for them. This massive snake had been seen around her property for quite some time, but a general rule of nature is to leave things alone if you want them to leave you alone, so she had. Well, that’s one rule the pithing *did* stick to, but it couldn’t grasp the concept of personal property and ended up coming in anyways.